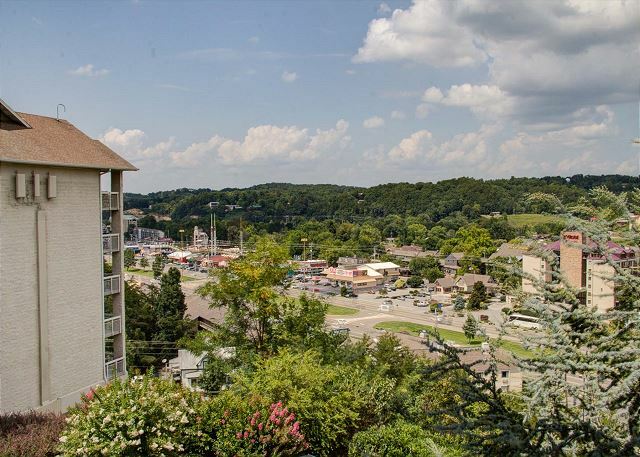 Our Two Bedroom Condo is in the heart of Pigeon Forge, which means it is close to top attractions like the Dixie Stampede, Smoky Mountains, Hatfield & McCoy etc. 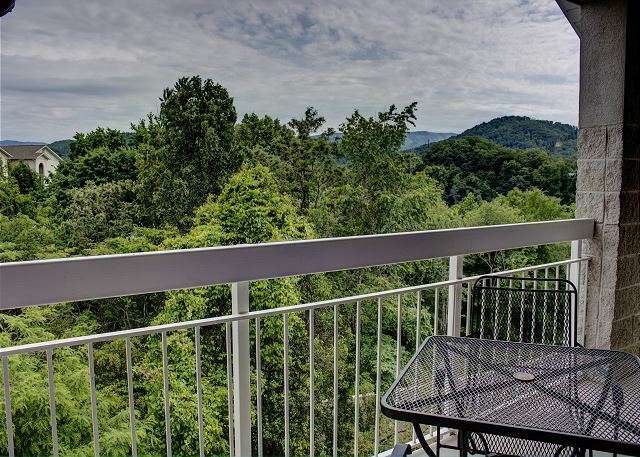 Our luxury condo sits on the top floor and offers amazing views of the National Park. King size bedrooms and full bathrooms make this a great rental for any small family or travelling friends. The Indoor Pool Facility is right next door. Join us for a Smoky Mountain Vacation you won't soon forget! WE had a wonderful and peaceful experience. We really enjoyed the cozy feel of the condo, as well as the beautiful view of the mountains. We will definitely visit again in the near future. Wonderful news!!! 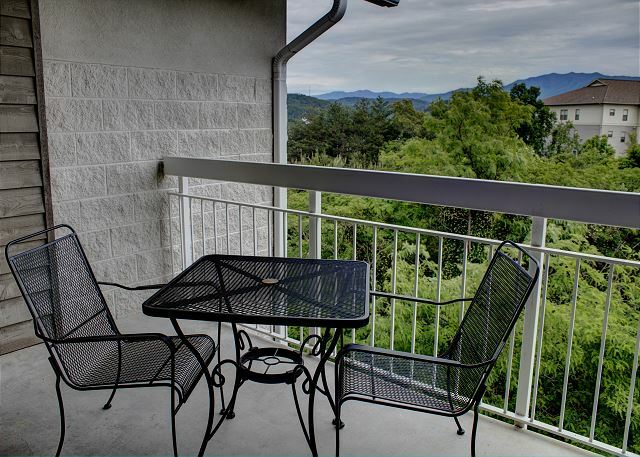 We are delighted that you had such a wonderful, peaceful experience at Whispering Pines Condos in Pigeon Forge. Yes, the view from your balcony is amazing and we look forward to your return. Love it at Whispering Pines even if it did rain every day. We still had fun and enjoyed each day. The room was set up with handicap equipment in the bathrooms which was great for my disabled husband. Would love if there was some with walk in showers! Thank you for your kind comments regarding your stay at Whispering Pines. So pleased to hear you all enjoyed your stay, despite all that rain. We actually have several owners redoing their bathrooms and putting in walk-in showers right now so next time you stay with us, be sure to ask for one. 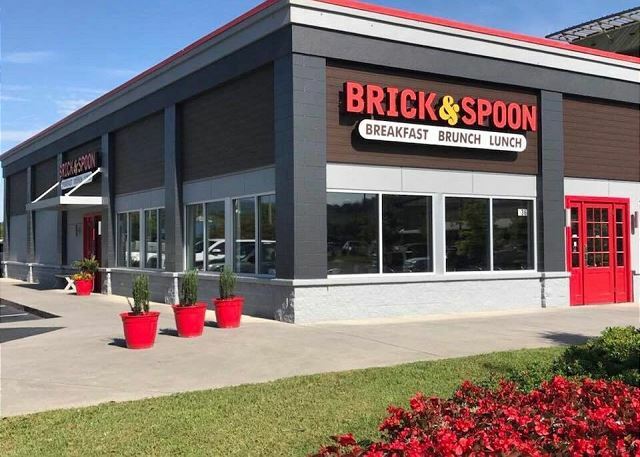 Again, thanks for staying and we hope to see you again the next time you are in the Pigeon Forge area! We have stayed at Whispering Pines Condos several times and been very pleased. This time was the same except some of the electricl outlets did not work and the stove burners were very slow in heating up, but as usual the condo was very nice, clean and we enjoyed our visit there. Thank you so much for being a loyal guest with us at Whispering Pines Resort. We have reported both issues mentioned to our maintenance department. Thank you for letting us know so that we can address these issues promptly. It is always our pleasure to have you as our guest, we look forward to your next visit. The condo was wonderful. We enjoyed our stay at the very nice condo. We were impressed at how clean it was. 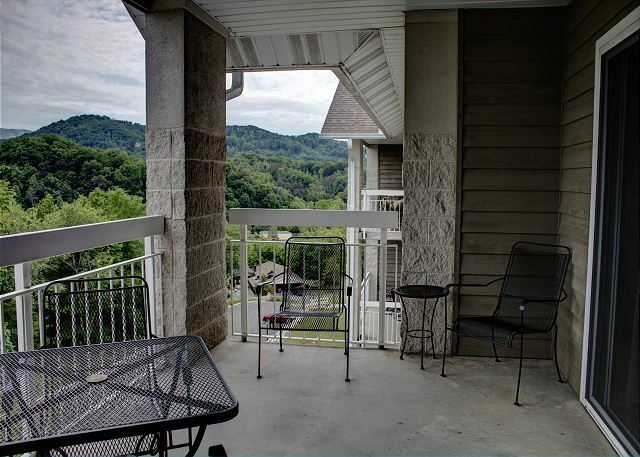 We are glad that you enjoyed your stay at Bear Crossing Condos on the River in Pigeon Forge and that you and your friends will return to make more wonderful memories. very nice and clean, large rooms and beds, nice balcony, liked everything about it. Excellent! Thank you so much for staying with us! We are happy you all enjoyed your time with us and we look forward to seeing you again soon! This was our first time at Whispering Pines. A friend recommended it. We were not disappointed. It was in a great location. The great experience started at check-in. The staff was so friendly. The rental was as described. It had so many towels. That made this momma happy. My sons (age 15 & 16) took advantage of the pool every chance they got. I highly recommend this place. You won’t be disappointed. Thank you so much for staying with us at Whispering Pines! You tell that friend of yours we greatly appreciate their recommendation; we appreciate your kind words as well! That is certainly our goal is to exceed expectations and provide each guest with an A+ experience! 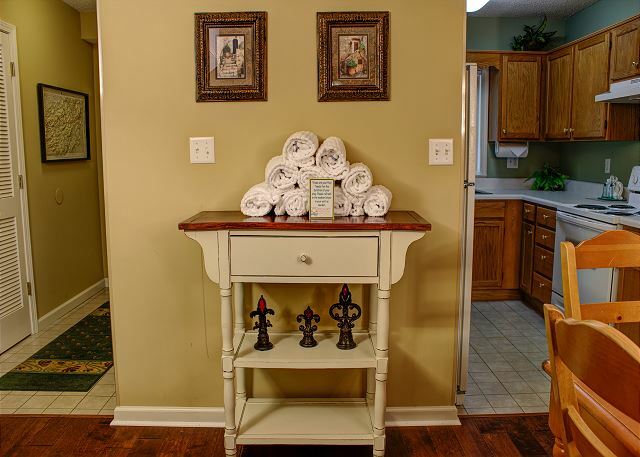 We are so ecstatic to hear you and your family enjoyed every aspect of the stay, even down to the towels. We hope we left such an impression to see you all again soon, and thank you again! Very nice, clean room. Conveniently located in the middle of town. Staff went above and beyond. Great! Thank you so much for staying and for the kind words! We try very hard to make sure you have the best time possible during your stay and it really helps to know you did :-) Come back and see us anytime! We really enjoyed our stay at Whispering Pines. The Condo was perfect and we will be back next year. 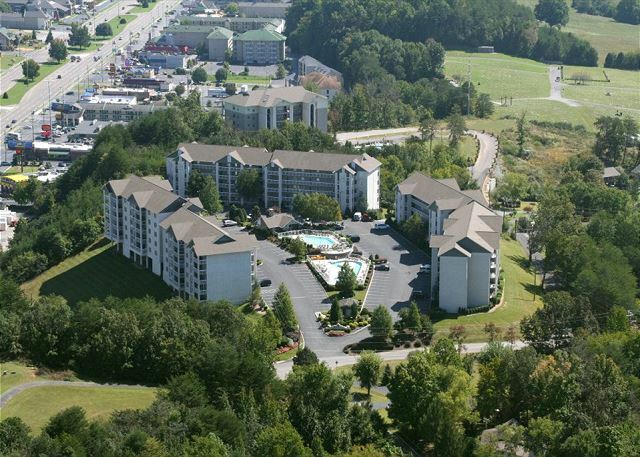 We look forward to your annual visits; glad you had a great time at Whispering Pines Condos in Pigeon Forge this year. We appreciate your perfect review and excellent comments. The condo was comfortable, in a good location on the parkway with a nice view. The staff were awesome and went beyond our expectations to help us with a minor issue! Thank you so much for all the kind words, they are appreciated! We are very happy you enjoyed your time with us and we hope you can come back and stay with us again soon! Condo was clean. Plenty of room. Very convenient. Thank you for your feedback and for staying with us at Whispering Pines. We appreciate your patronage and look forward to seeing you again soon. Great! Come back again as soon as you can! October is a great time to see this beautiful area! Our condo at Whispering Pines was great. The balcony was a wonderful gathering place, with plenty of room for 6+ people. The condo was very clean and well stocked. Parking was never an issue no matter the time we returned to the condo. It was so nice to call the resort and actually talk with someone from the area. We will stay at WP again. Wonderful! We are so excited to hear that you had a great experience while staying with us at Whispering Pines. We hope that many family memories were made during your gathering. We love interacting with out guests as well and are always here to help you with reservations or while vacationing with us. We look forward to seeing you again soon. Love the location and price. 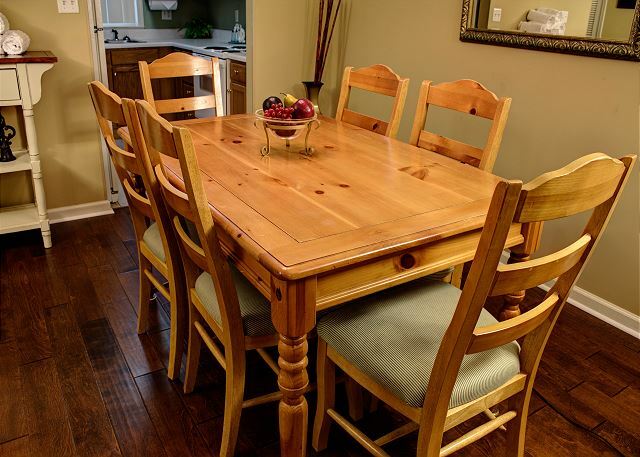 Whispering Pines is in a great location and has spectacular views of Pigeon Forge and the beautiful Smokey Mountains! Thank you for spending time with us and hopefully making some great memories, we hope to see you all again soon! Great! Thank you for staying with us! We hope we take care of you again soon! CONSISTENTLY CLEAN AND WELL MAINTAINED. OUR FAVORITE RENTAL. WHISPERING PINES IS THE PREMIERE PROPERTY IN THE AREA. FIFTH TIME IN FIVE YEARS. ALREADY BOOKED FOR NEXT YEAR. STAFF ANXIOUS TO PLEASE. ALL THE EXTRAS YOU COULD WISH FOR. Thank you so much for all the kind words! We work hard to make sure every single guest enjoys there stay! We are happy you enjoyed your stay with us and we appreciate your loyalty! Come back and see us soon! 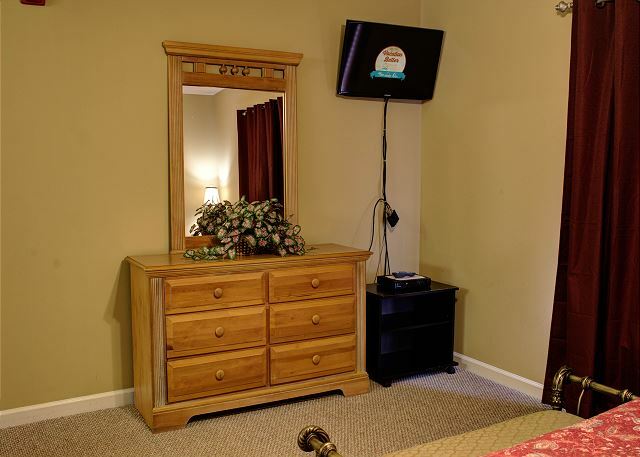 We love to stay At Whispering Pines in Pigeon Forge. We have stayed there for the last five years. Can't find a better place. Always find the condo well maintained and always very clean. The management is always ready to help in any way. Always very friendly. I have recommended this place to friends and relatives. Rates are very reasonable as well. Great! Thank you kindly for the kind words and for being a loyal guest! We are happy you always enjoy your stay with us and we will always do our best to keep it that way! Everytime we visit Pigeon Forge we stay at Whispering Pines. 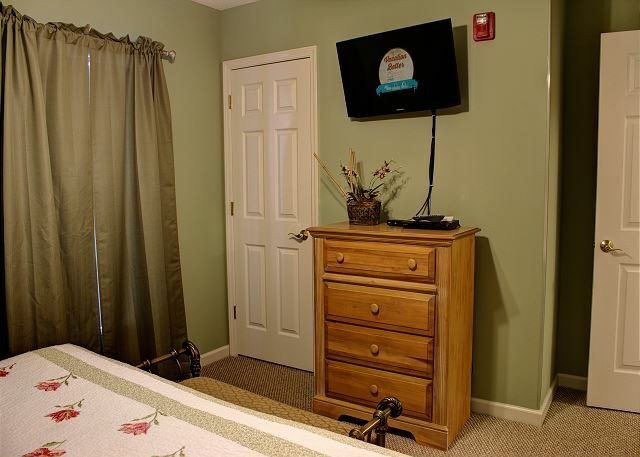 The condos and customer service you receive is simply wonderful!The rooms are very clean and spacious! Thank you so much for staying with us! We appreciate you being such a loyal guest, thank you for the kind words! We look forward to seeing you again soon! We had a wonderful stay again this year. The condo was very nice, clean and cozy. Thank you again. "Again" is a wonderful word! Thanks for staying with us again. We appreciate your perfect review and awesome comments. 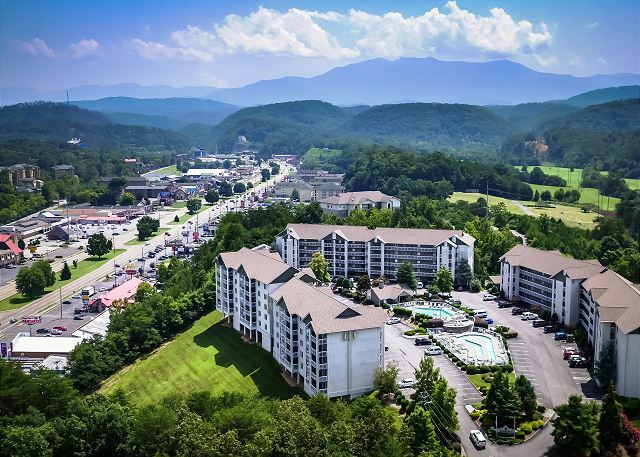 See you at your next Family Vacation in Pigeon Forge. We are happy to know that you had a great stay with us at Whispering Pines. We welcome you back to stay with us again soon! We loved the condo and the grounds. Perfect location. Thank you for staying with us at Whispering Pines during the New Years holiday. We are so pleased to hear that you loved your getaway. We appreciate your wonderful review and look forward to seeing you again soon! It was a nice condo, but the one we stayed in before was much nicer. The biggest complaint was the tables were pretty beat up, and there wasn't enough living room seating for the 6 people the condo slept (one 1 couch and 2 recliners). Other than that it was great. Thank you for coming back and staying with us again. 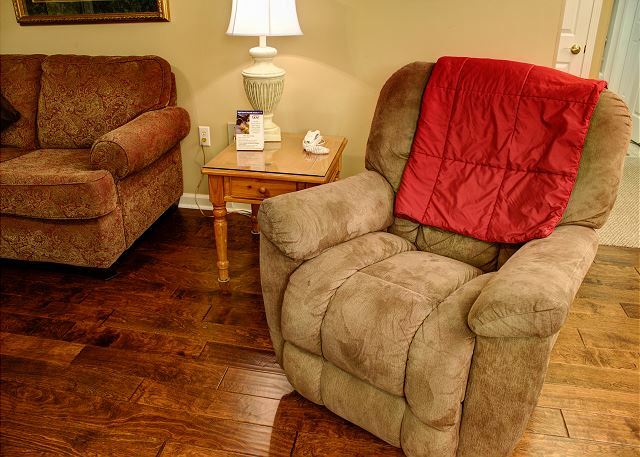 We will pass along your comments regarding living room furniture to the condo owner. Happy to hear you all had a great stay otherwise. See you again soon. The condo was very nice and had everything we needed. The staff was very friendly and professional. Would stay here again. Happy Belated Anniversary! We are so glad that you celebrated your anniversary with us. Hopefully, you will do this again. We enjoy meeting wonderful people as you. This was my 2nd stay. Everything comes as advertised. Highly recommended! Thank you for coming back to stay with us again at Whispering Pines. We appreciate your review. Thank you for recommending us to others. We hope that you are able to visit us again soon! We had a wonderful stay again at Whispering Pines. We have stayed here for numerous years. Starting in building #5 years ago and working our way around to #3 this year. Always clean and well managed. The staff is always very helpful. The room was very nice and comfortable. We will be staying here again. We only have one complaint this year. We must have parked at an ant bed because we had a major infestation of ants in the car. There was no food left in the car, but we did have ants crawling on the outside of the car when we got ready to leave sunday morning. We only had a few in the car, but was easily taken care of with ant spray. We also fogged the car when we got home on sunday afternoon just to make sure. Thank you so much for your wonderful review. We appreciate you being a repeat loyal guest with us for many years. Thank you so much for your kind words regarding our staff. We are sorry to hear about the ants in your vehicle, the heat and little rain have really brought them out this year. Thank you for your feedback and we look forward to seeing you again soon. Check in and our stay was a very good experience. 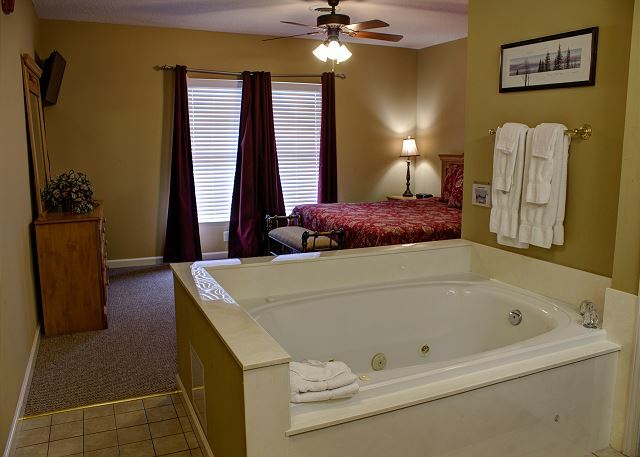 Thank you for staying with us at Whispering Pines. We are glad that you had a great experience with us. We look forward to your next visit with us. 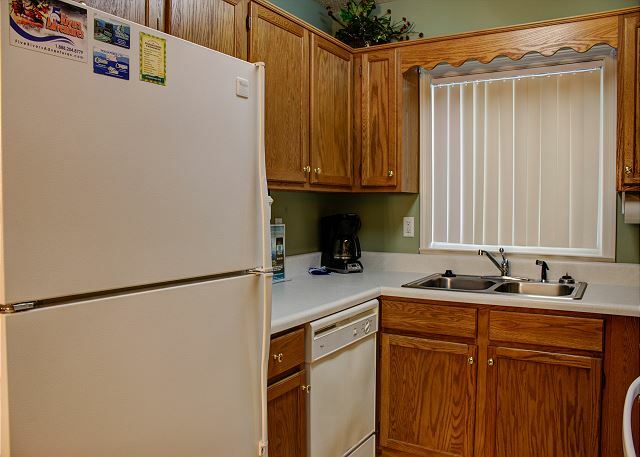 Everything was clean, Condo was very spacious and accommodating. We had a nice view of mountains. It was such a relaxing condo. Also the swimming pools and shelter were nice. The beautiful mountains of Tennessee have a way of "calling people back to them." 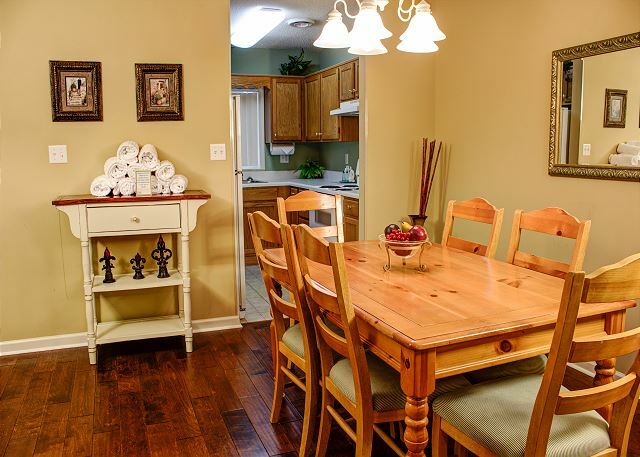 Glad you enjoyed your spacious, clean condo at Whispering Pines Condos in Pigeon Forge, TN. We are here for our 2nd year in a row. World Series Softball Tournament brings us here and a lovely & convenient condo makes us return again! Thank you so much for staying! Hope you can make the trip again next year! First time staying at Whispering Pines Condos. Great experience, very nice staff. Room was very clean and comfortable. 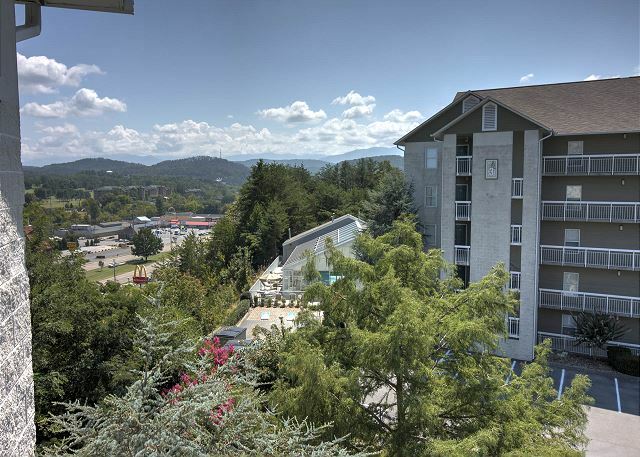 Great location in Pigeon Forge, TN. Wonderful! So glad you enjoyed your time with us, especially as a first time guest......hope you will stay again soon! The condo was very nice, well maintained and comfortable. The only issue I had was the floors were not really clean. They looked clean, but my white socks were black in a very short time. Other than that, everything was very nice. The staff is SUPER. 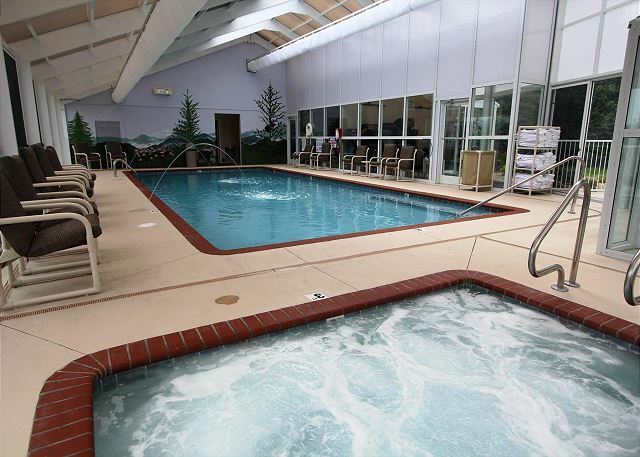 The indoor pool is a nice size and the grounds are very well maintained. I will stay here again. Thank you for the great feedback! We hope you will come back and see us again soon! This was the third time we stayed at Whispering Pines this past year, and we really love the resort and the amenities available here, as compared to a regular hotel room. And, the cost is VERY reasonable if you can share it with another couple. Thank you for being a loyal guest at Whispering Pines. We appreciate your wonderful review more than you know. We hope that you have found your your new home away from home with us. Thank you for your business and we hope to see you again soon. The condo was perfectly clean had all we needed. Love the view from the balcony and the fireplace. We will return for another girls weekend. We had a great location to where we wanted to go around town. Girls weekends are the best! 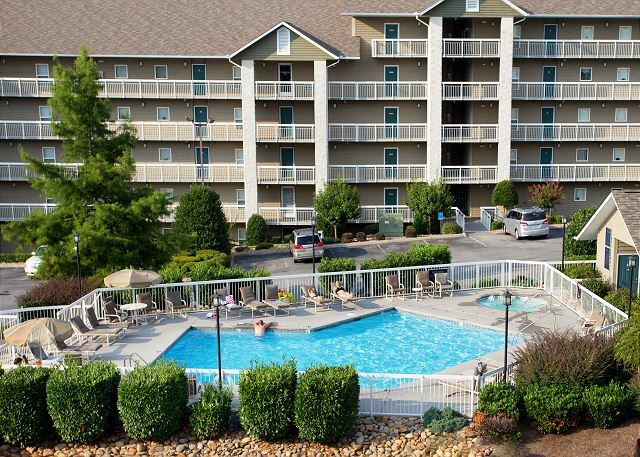 Happy to hear you and your friends enjoyed your trip to Pigeon Forge and found the condo to be just what you needed! We appreciate you staying and taking the time to review your time spent with us. We certainly look forward to having you all back again! The staff is excellent everything was good. The condo needs some updating. The kitchen walls are grease covered over the range and the kitchen walls have stains in other areas as well. The patio door was dirty. Other than these things all was well. Plenty of linens, and other necessities. Very comfortable, my husband loved the super king size bed. 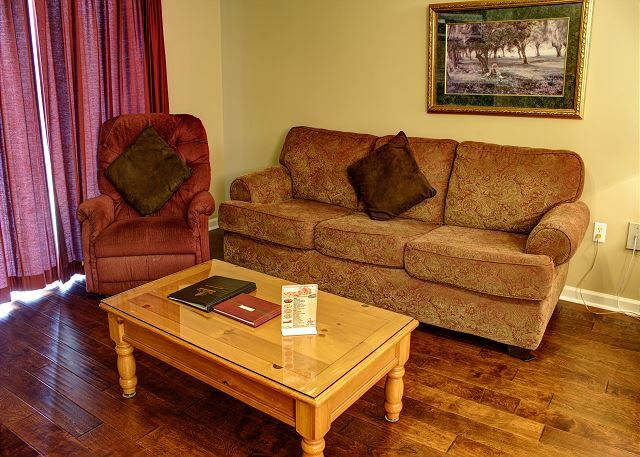 Thank you for staying with us at Whispering Pines. We appreciate your wonderful comments regarding our staff. We will contact our housekeeping department regarding the kitchen issues you describe. Please always let the front desk staff know if you have any issues during your stay. We would have been happy to address this issue while your staying with us. We are happy to hear that you enjoyed the king size bed and that you found it comfortable. We hope that you will visit us again. 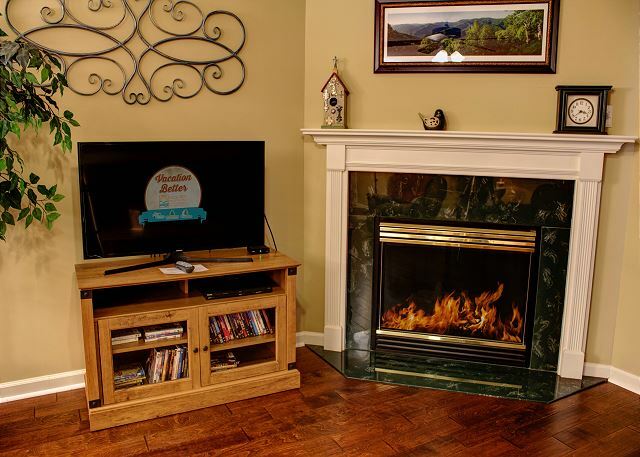 Great Condo in Pigeon Forge! We enjoyed our week in this was super clean and tastefully decorated....we do not have any complaints! 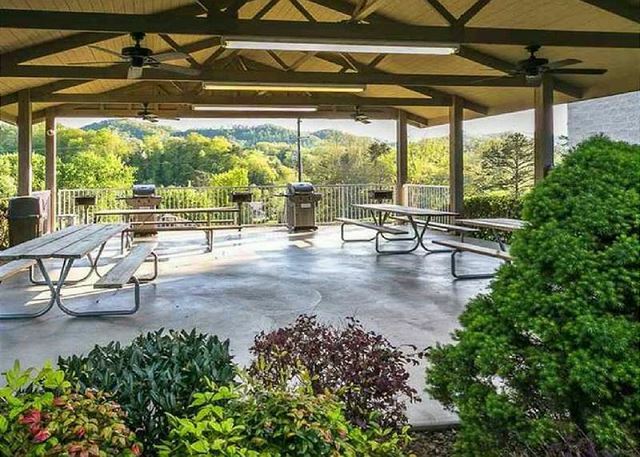 It's in a central location, close to all restaurants and attractions,and we could see the fireworks from Dollywood every night perfectly from the front balcony!I would definitely recommend this unit to others and would love to stay here again! Thank you so much for your wonderful review. 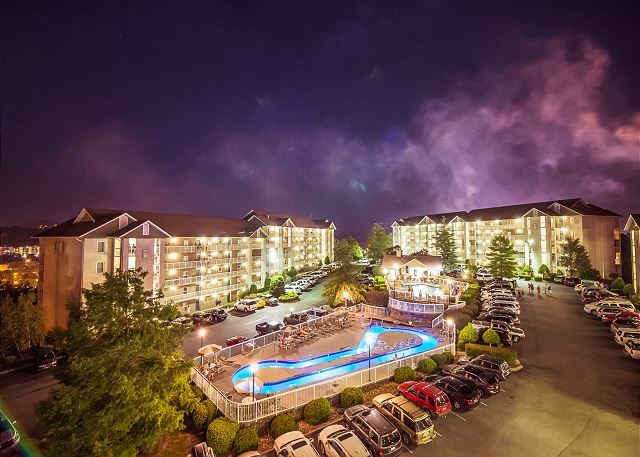 We are so excited to hear that you enjoyed your stay, the condo location and the amazing bonus of seeing Dollywood's fireworks from your balcony. We appreciate you recommending us to family and friends and hope you can visit us again soon. Awesome! So glad you had a great trip to the area. We hope to see you again soon. Thank you for staying with us! We hope to see you soon. Very nice place! Clean. Comfortable. Far better than most places in the Gatlinburg area! Very nice staff. Would definitely stay there again. Thank you for your feedback! 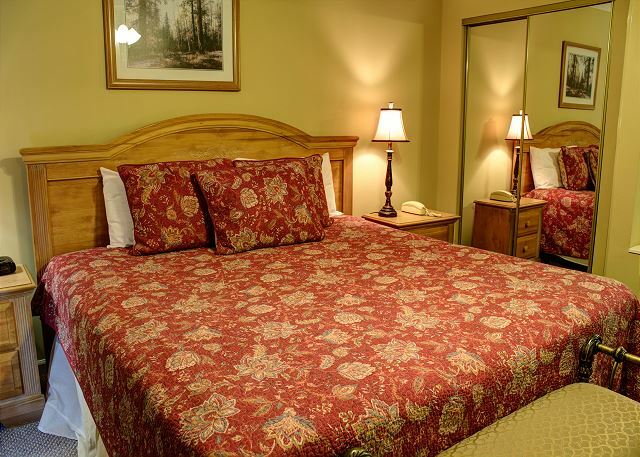 We are happy to hear your enjoyed your stay with us at Whispering Pines. We strive to provide comfortable and clean accommodations for all of our guests, in hopes they will return when coming back to visit our area. We truly appreciate your patronage and look forward to your next visit with us. We are so happy to hear you enjoyed your stay in condo 352 at Whispering Pines. We appreciate your patronage and look forward to your next visit. We made a quick trip to the Smokies over New Year's weekend. We usually stay is Whispering Pines 553, but it wasn't available. We chose WP352 based on it's similarity to WP553. We liked the unit we chose quite a bit. It really suited our needs. It seemed to be in the middle of some small upgrade, but nothing that hampered our stay. This could be our new choice of condos. Thank you for your feedback! 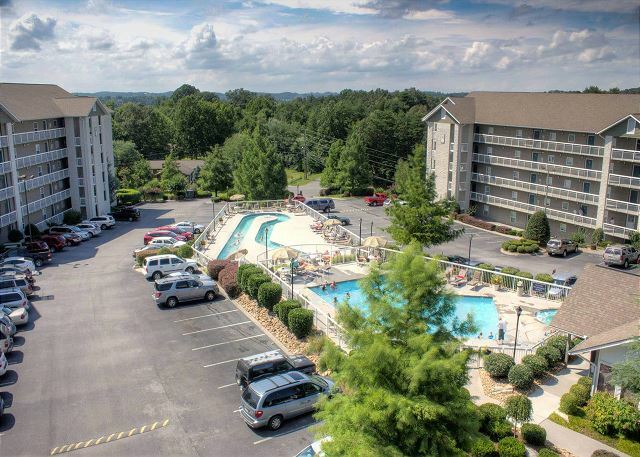 We are happy to hear that you enjoyed your stay at Whispering Pines condo 352! We look forward to seeing you next time. 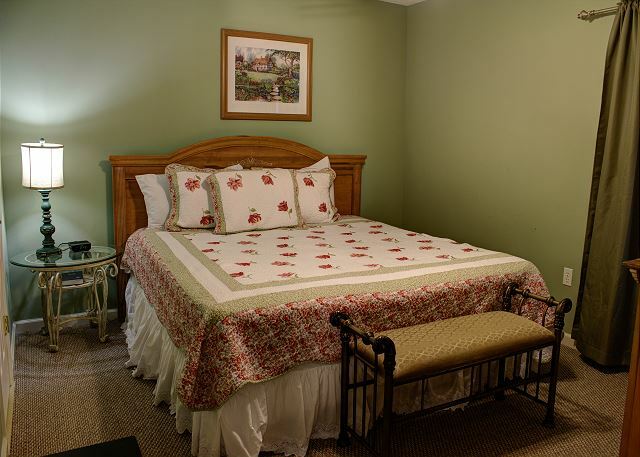 Thank you for staying with us in one of our two bedrooms this past week. We appreciate you staying and we are happy to hear you enjoyed your trip! We hope to see you again soon! We had a preasure free time,doing just as we pleased. Thank you so much for staying with us at Whispering Pines Resort. We are pleased to here that you had a stress free, relaxing stay with us. We hope to see you again soon. We had a wonderful time in Pigeon Forge. The condo had a good view of the mountains. We were very pleased with the staff and treated very nice. Everybody was friendly and helpful. We are so happy to hear you had a great stay at Whispering Pines. We strive to ensure all of our guests feel at home and are treated with a friendly attitude when staying with us. We hope to see you in the future and we appreciate your business! Spent 5 days at the Whispering Pines and was extremely satisfied. Thank you so much for staying with us. We are so happy you enjoyed your stay at Whispering Pines Resort. We look forward to your next stay with us! Everything was great!! Had an issue with one DVD player and one remote but someone immediately fixed the issue. The only thing I would recommend is some cushions for the outside chairs. Otherwise everything was perfect. Happy to hear you enjoyed your stay with us! We will forward the recommendation about outdoor cushions to the condo owner. Hope to see you again! Our stay was pleasant and relaxing. Bonus of being able to see the Dollywood fireworks. Vacations should be relaxing-thanks for choosing to vacation with us!